Directed by Alexander Payne and written by Bob Nelson, Nebraska is the story about an old man who believes he has just won a million dollars as he goes on a road trip to Nebraska with his son to claim the money. The film plays into Payne’s fascination with American families and their dysfunctions where a father and son try to bond through this road trip to Nebraska. Starring Bruce Dern, Will Forte, June Squibb, Stacy Keach, Bob Odenkirk, Mary Louise Wilson, Missy Doty, and Rance Howard. Nebraska is a rich and rapturous film from Alexander Payne. The film is a simple story about an old man from Billings, Montana who is convinced he just won a million dollars and has to go to Lincoln, Nebraska to claim that money. While his wife and sons are convinced that it’s untrue, one of the sons decides to drive his father to Lincoln where they would stop at the old man’s old hometown of Hawthorne to meet with family. Upon the news that Woody Grant (Bruce Dern) has won a million dollars, families and old friends are eager to get a share of whatever money Woody owed them. Though the film is partially a road-film about an old man getting some money, it is really about a young man trying to give his father a chance to live out this fantasy as he is unaware that it could be a scam. Bob Nelson’s screenplay explores the mind of this old man who has lived a decent life but his marriage to his wife Kate (June Squibb) has been rocky and he’s succumbing to age. The letter he receives from Lincoln, Nebraska has him wanting to get something that he believes is his yet walking from Montana to Nebraska has people convinced he’s lost his mind. While Woody’s eldest son Ross (Bob Odenkirk) is convinced that his father should be at a home, Ross’ younger brother David (Will Forte) thinks the only way for his father to face reality is by going to Lincoln and to make him face the truth about the prize. In stopping at Hawthorne where they live with some relatives, David learns more about his parents and his father where he meets an old friend of his father named Ed (Stacy Keach) who learns about Woody’s winnings. While it is a light-hearted drama, there is a lot of humor that is prevalent through the film as much of it comes from Kate who is annoyed by her husband’s actions as she would travel to Hawthorne in the second act as her comments and action bring much of the film’s humor. Still, it is a study about the relationship between father and son as despite some of David’s resentment towards his father over his alcoholism and not really being there very much. He still wants to help his dad where he learns a lot about him and why people are after him for money as if Woody owed them something as he is considered a celebrity in his hometown. The third act isn’t about Kate, David, and Ross defending Woody but also realize the danger of getting a million dollars where all Woody wanted with his winnings are a new truck and a new compressor. It does play into the fact that money can’t fix or buy everything yet a guy like Woody can still be rich without all of those things. Alexander Payne’s direction is mesmerizing in not just the way he tells the story in a black-and-white photography style to recall some of the films of the 1970s. It’s also a film that takes place in a world as unique as the American Midwest where much of the film takes place in Nebraska as well as Billings, Montana and parts of South Dakota and Wyoming. It’s a world that may seem disconnected a bit from the major cities of the east and west coast yet it is still one that is fascinating. By shooting in actual small towns like Hawthorne, Nebraska and the city of Lincoln, Payne is able to use lingering wide shots of these landscapes and location to give something that really feels Americana where it is a place that sort of feels lost yet is rooted by these old school ideas. Notably as locals hang around in bars and watch football games where it’s a world that is pretty simple. Payne’s usage of close-ups and medium shots for the characters showcase much of the growing sense of loneliness that Woody is feeling as he returns to his hometown where he deals with the fact that some things have changed and some things haven’t. The close-ups that Payne uses showcase not just the lack of time that Woody has but also his grizzled determination to get what he thinks he deserves for all of his hard work and generosity towards his friends and family. While Payne balances much of these moments with humor and some light-hearted drama, he also creates something that is very touching where it is a family that manages to bond through this adventure no matter how dysfunctional they are. Overall, Payne creates a very sensational and fascinating film about an old man trying to claim something and regain the love he seemed to have lost from his family. Cinematographer Phedon Papamichael does amazing work with the film‘s black-and-white cinematography where he creates a very classical look to many of the film‘s daytime interior and exterior locations along with some rich lighting for some of the film‘s nighttime exterior scenes. Editor Kevin Tent does brilliant work with the film‘s editing as it‘s stylized with its use of transition wipes, dissolves, and fade-outs to play with the film‘s dramatic structure and humor. Production designer J. Dennis Washington, with set decorator Fontaine Beauchamp Hebb and art director Sandy Veneziano, does excellent work with some of the film‘s set pieces such as the bars that Woody and David go to as well as the house of the relatives they stay at. Costume designer Wendy Chuck does terrific work with the clothes as it‘s mostly casual where it‘s mostly sweaters, sweat-shirts, jeans, and such to play into that world of the American Midwest. Sound designer Frank Gaeta does superb work with the sound from the atmosphere that goes inside the relatives home to the calmness of the road. The film’s music by Mark Orton is just fantastic for its folk-based score with its usage of low-key acoustic instruments, violins, and trumpets to play into some of the film’s melancholia while its soundtrack consists of rock, pop, and country music that is played in the background. The casting by John Jackson is incredible for the ensemble that is created as it includes some small yet notable appearances from Missy Doty as David’s ex-girlfriend, Angela McEwan as a former girlfriend of Woody’s, Devin Ratray and Tim Driscoll as David’s dim-witted cousins, Mary Louise Wilson as Woody’s sister-in-law, and Rance Howard in a sort of silent performance as Woody’s brother Ray. Stacy Keach is excellent as Woody’s old friend/former business partner Ed Pegram who is happy to see Woody while he hopes to get some of the money that Woody had owed him many years ago. Bob Odenkirk is wonderful as Woody’s eldest son Ross who is the success of the family who reluctantly goes to Hawthorne where he finds himself trying to defend his father. June Squibb is absolutely fantastic as Woody’s wife Kate as this woman who seems to had enough of her husband and his eccentricities while defending him and saying many things that are quite shocking as well as some of her activities that she does. Will Forte is amazing as Woody’s youngest son David as he tries to understand what his dad is doing while using the road trip as a way to get to know him while learning about some of the dark secrets in his family forcing him to stand up for his father. Finally, there’s Bruce Dern in a tremendous performance as Woody Grant as this cantankerous and senile old man who thinks he had just won a million dollar as he is determined to go to Nebraska to claim it. It’s a performance that is funny at times but also a bit sad knowing that Woody is sort of losing his mind and there’s people around him wanting to take advantage of him as it’s a truly magnificent performance for Bruce Dern. 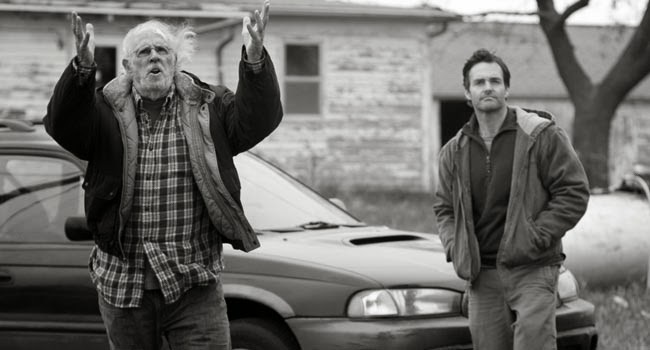 Nebraska is a phenomenal film from Alexander Payne that features a remarkable performance from Bruce Dern. Thanks to its amazing supporting cast that includes Will Forte, June Squibb, Bob Odenkirk, and Stacy Keach along with a brilliant score and Phedon Papamichael’s superb cinematography. The film is definitely one of Payne’s finest films in not just explore the beauty of the American Midwest but also how a dysfunctional family come together to help their patriarch get what he thinks is his. In the end, Nebraska is a spectacular film from Alexander Payne.